MyNetDiary has everything. Since 2008, we refined and improved it based on feedback from our users, making it better and keeping it simple. And we succeeded – since 2011, MyNetDiary Pro has a stellar 5-star average rating on the App Store – the only paid diet app! Over the years, MyNetDiary's apps were featured by Apple in many collections - "Get in Shape", "New Year, New You", "Health & Fitness Essentials", and more. The app is regularly updated. Most recent improvements: built-in support system with FAQs, great Today Widget and Apple Watch app! There are many thousands of success stories and user reviews. There is no better way to lose weight than with MyNetDiary. The most frequent words in thousands of MyNetDiary reviews by its users are “easy” and “very user-friendly”. MyNetDiary is comprehensive. But most importantly, it is easy, friendly, and fast – the features are there when you need them, not overwhelming you, making diet tracking easy, and you – successful! One of the reasons that MyNetDiary is so effective and our users are successful is that MyNetDiary is based on solid science. In a study, published in November, 2013 issue of the American Journal of Preventive Medicine, MyNetDiary was identified as the best weight-loss mobile app, incorporating the most of the recognized evidence-based behavioral weight-loss strategies proven to be effective. 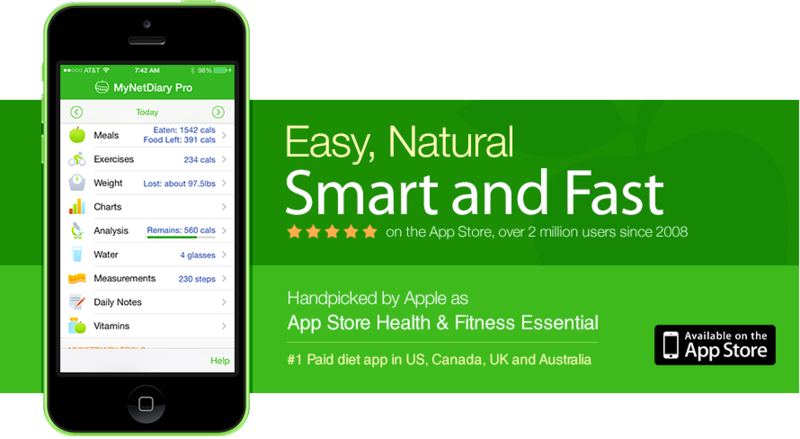 All other diet apps, including Livestrong, MyFitnessPal, and Lose It! are trailing far behind. MyNetDiary has a large, high-quality food database, with 716,000 foods entered by us and 263,000 contributed foods. The quality is ensured by MyNetDiary's PhotoFood Service. If some food is not in the database or out-of-date, you can send us its photos directly from the app, and we will enter or update all of its nutrients, saving you time and ensuring accuracy. Some apps claim to have over a million foods in their database, but they allow anyone to enter foods. There is not a million of foods on our whole planet! Such databases simply have tons of duplicates and out-of-date foods – no one can keep up with them. MyNetDiary is the #1 food database in the world on the balance of quantity and quality. MyNetDiary looks quite similar to Apple's apps, making it instantly familiar. On closer look, though, it is custom designed, with many subtle and beautiful additions. A full set of custom icons is included, so you can make your food diary beautiful. You can customize food icons on the Food Label screen. If you are on a low carb diet, in MyNetDiary Pro you can choose to show carbs instead of calories. MyNetDiary Pro also provides options for food time tracking – great when you eat more frequent, smaller meals. MyNetDiary is so fast that it searches as your type, you don't need to type whole words and you can see results faster. Since you enter many foods a day, this saves you much time every day! MyNetDiary also remembers how you searched for each food and displays them on top, so the next time you only need to enter first few characters to find it – again, saving you much time! MyNetDiary also remembers your previous serving entries for each food, displaying all of them in a list, so you can enter them with just one tap. MyNetDiary supports many serving types for each food. Finally, MyNetDiary provides "Favorites" – allowing you to enter your previous foods without even searching! MyNetDiary also has a special GPS Tracker feature for the iPhone, automatically syncing your running, walking, cycling to your MyNetDiary account and all mobile apps. The Exercise screen of all of our iPhone Apps has a feature "GPS Tracker". On iPhone 5S and later, MyNetDiary can use built-in iPhone M7/M8 motion sensor and automatically track your daily step count. MyNetDiary provides a built-in barcode scanner. When you enter your daily foods, tap the scanner button to activate it. MyNetDiary barcode scanner works on all iPhone models! MyNetDiary Pro allows to pick from up to 45 nutrients for tracking. Fat-Carbs-Protein ratio is calculated automatically. On the Plan screen, you can set custom target nutrient ratio. Diabetes Tracker app provides net carbs and diabetes carb count tracking. The Report screens shows you all meals and foods together. The Daily Analysis screen shows your daily energy balance, estimating how much weight you are losing (or gaining) on each day. MyNetDiary PRO also provides Weekly Analysis, comparing and evaluating average calories and nutrients over the week. This allows to look at the bigger picture and trends, and help you learn about overcoming slower than expected weight loss or weight plateau. Sometimes deciding by a food label whether you should eat the food or skip it could be non-trivial. For example, what is more important – 6g of saturated fat or 30% of Vitamin C in the food? Which one outweighs the other? To help you interpret food labels, MyNetDiary provides Food Score – displayed in the top right corner of food labels in MyNetDiary. The food score is calculated based solely on the food's Nutrition Facts. The methodology was published in the June 2009 issue of the Journal of the Academy of Nutrition and Dietetics, in the article Modeling Expert Opinions on Food Healthfulness: A Nutrition Metric by Jolie M. Martin, MBA, PhD et al, and used by MyNetDiary with permission. The study distills expert knowledge of leading U.S. nutrition experts into a simple nutrition metric, to help all of us to make more healthful food choices. The most important chart – Weight Chart – shows your weight progress, indicating your target weight and projected weight loss curve. There are many more charts in MyNetDiary Pro – helping you visualize and compare with plan your macronutrient balance (in grams, calories, and percentages), and see your calorie deficit. If you track body measurements other than weight, you can also see each of them on the charts. If you often eat the same foods together, you can create a recipe. The next time you eat them, you only need to enter one food – the recipe itself. MyNetDiary Pro provides a powerful recipe editor – allowing you to adjust the recipe, to add or remove ingredients, or adjust their amounts. In MyNetDiary Pro, you can also customize and override your calorie targets, and customize macronutrient balance – great for low-carb and low-fat dieters! The widget shows remaining calories and meal buttons to jump into specific meal. Finally, you can count your water glasses right in the widget, without even opening the app! It's quite a time saver, and it's very important to hydrate properly! Log water glasses and record your current weight. There are many more tools in MyNetDiary – overall, there are more than 50 screens in MyNetDiary Pro. They are there when you need them – water tracking, notes, vitamins and medication, optional PIN protection, and a full set of body measurements – not only weight! You can join MyNetDiary Community, with forum supported by a Registered Dietitian, or check out articles on weight loss and healthful living. The app provides easy access to MyNetDiary Library, with many helpful articles providing tips and advice on healthy eating, diet, nutrients, dealing with weight plateau, and more. All articles are written by a Registered Dietitian. MyNetDiary is highly customizable, supporting food time tracking, metric and US measurements, as well as kJ units. MyNetDiary provides many tools, online and in mobile apps. For iPhone, MyNetDiary provides two diet apps – free and PRO, and one special diabetes tracking app. Additionally, the free app used with MyNetDiary Maximum account unlocks all the PRO features and much more. MyNetDiary provides a great free iPhone app, covering all the basics, similar and often superior to popular MyFitnessPal and Lose It! apps. Includes free MyNetDiary website access for online food and exercise tracking! Includes free MyNetDiary website access for online food and exercise tracking! Custom trackers – track anything you want, your mood, your sleep – anything! Optional blood glucose and diabetes tracking – you don't need our special diabetes app if you are Maximum subscriber. The subscription includes full MyNetDiary website access!